DC Comics' "New 52" plan was a big gamble. They reset their universe in a way they really hadn't since Crisis on Infinite Earths - everything except Batman and Green Lantern (because Grant Morrison is too big to edit, and Geoff Johns was an executive by then, so why should either of them have to cut their ongoing stories short?) was reset from zero, rather than the soft reboots they'd had every few years before. It seems to have worked out though, because other than a few fanboy holdouts who will take any opportunity at all to whine about "when are the real versions coming back," everybody seems to like the new books more than the old ones, and it's given some characters a chance to get back into the spotlight after a long time away. 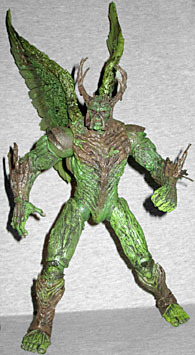 Alec Holland, the man inside Swamp Thing, had been brought back to life at the end of Blackest Night, and that status quo was carried over to New 52. The book opened with him not being Swamp Thing, and trying to avoid that destiny - but when he finally embraced it, he was a new kind of monster. The one defining feature of Swamp Thing has always been the weird, vaguely skeletal ridge that runs down from his nose - even when he grows himself a new body from some random plent, that nasal thing is part of the design. It's present on this toy, along with some oddly lucious lips, a Bruce Campbell chin, and red eyes under his heavy brow. Also, he has antlers. 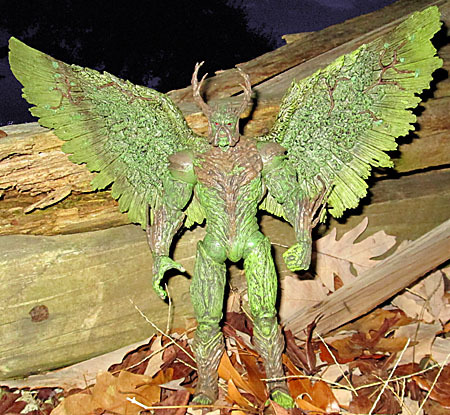 The idea of this incarnation of Swamp Thing is that he's not just a foot soldier for the Parliament of Trees, he's now the warrior king of the Green. So instead of a spongy pile of moss and weeds, he's formed himself some armor from bark. It covers his chest, shoulders, forearms and shins, and even the other areas of his body still look firm. With that in mind, the "antlers" and the little spikes on top of his head serve as a crown befitting his status. 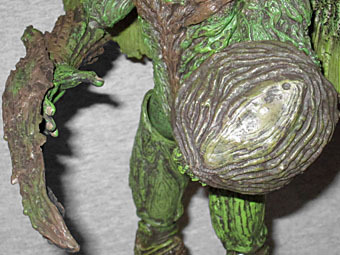 The figure was sculpted by Phil Ramirez, who also did Marvel Legends Man-Thing. But this is an entirely different kind of plant-man. It's less about the fine, intricate detail and more about the grain of woody plates and branches all in a line. 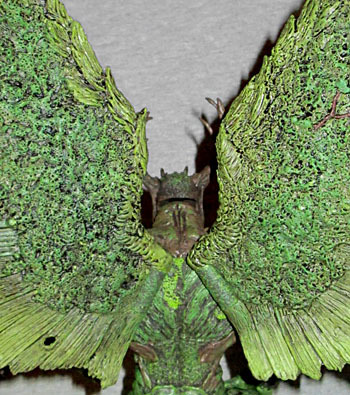 There's a little bit of moss, though, mainly on his shoulders and wings. Yes, wings. Why does a plant man need wings? Shut up, that's why. This design came from the "Rotworld" crossover, when Alec needed to cover a lot of ground very fast. He couldn't do his usual "grow a new body at the destination and shunt your consciousness over there" trick, so it was either walk or fly (or fire up the Bog Rover, but since that doesn't exist outside the Swamp Thing cartoon, it probably wasn't an option). They're beautiful pieces on this toy, with the "feathers" made from planks of wood, with moss instead of down, and with large leaves along the upper edge. It's great! 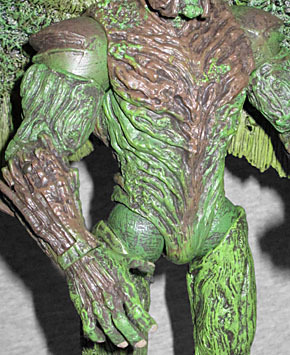 The last time DC Direct made a Swamp Thing, it was a statue with a few joints cut in. This one is much better, and while it still doesn't have a waist, the rest is great. The wings are hinged, and swivel where they go into the back. He has a balljointed head, swivel/hinge shoulders, swivel biceps, hinged elbows, swivel wrists, swivel/hinge hips, swivel thighs, double-hinged knees (the upper hinge even has a swivel, too! ), and... well, they're not really ankles, per se, because the joint is in the middle of the foot. It's a swivel/hinge thing, too, so he can flex it like he's walking, or twist it to stay stable when his legs are wide. It's hard to find a balance point for him, thanks to those giant wings making him all kinds of back-heavy, but the joints are sturdy. Since this Swamp Thing is going to war, he has two accessories to prepare him for that: a sword and a shield. They're wooden, just like his armor, and rather than being held in his hands, they just grow straight out of his arms. Since DCD doesn't want to leave ugly gaping holes in the toy's arms, they did something really clever: there are small twigs sprouting from the forearms; you can pull those out, revealing the slots where the accessories plug in - and thanks to the design of the armot, it's pretty much seamless! That's really good work on their part. I would like this figure even better if the wings and crown were removable, so you could have a more "plain" Swamp Thing when you wanted him. Still, if you think of this as a "battle armor" variation, he's super cool.